Hauskaa lauantaita, tervetuloa viikon Allsorts haasteen pariin! Nyt uppoudutaan satumaisiin tunnelmiin, inspiroidu jostain sadusta, lastentarinasta ja kerro mikä se on! "Helinä- keiju" inspiroi minua lilan mallikortin teossa. Hi; Happy Saturday, it's time for a new Allsorts Challenge! DT Ellie's theme is "Fairy Tales and Nursery Rhymes". Our sponsor is Bee Crafty, welcome to join us. My fairy card is "inspired by Tinkerbell". I used the favourites lilacs, colours of the year! 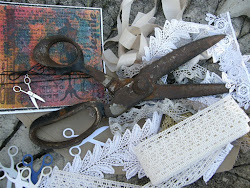 Cardstock Bazzill Pearly Romance, papers Heartfelt Creations; sewing machine in use! That pretty LOTV Fairy is perfect for Tinkerbell Mervi and pretty in the lilac colours. I only have on LOTV image and this is it, a gift from a friend and I find I use it often. Fantastic card Mervi, love the colors and such a great sketch too. Really beautiful car derv and a great take on the challenge, love the image and the colours, a super background too. Such a sweet design, Mervi - love all the purples, and the subtle script in the background! Thank you for playing along with us at the Simon Says Stamp Wednesday challenge! Thove it!! 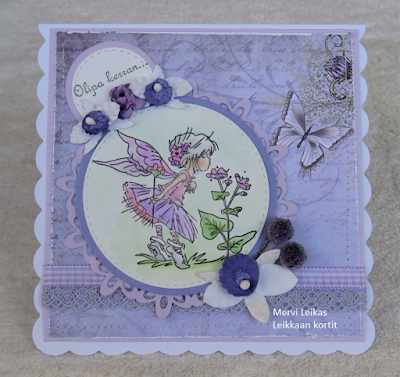 Thanks for joining our “Purple” challenge over at Incy Wincy Designs Challenge Blog! This is one of my favourite LOTV stamps, gorgeous take on the theme Mervi. Gorgeous colors on this card, purple of any shade is my favorite color. Sweet image, beautiful die cut frame and flower arrangement. Lovely card - thank you for sharing it at Incy Wincy Designs.